Humans have two near identical copies of Survival Motor Neuron gene: SMN1 and SMN2. 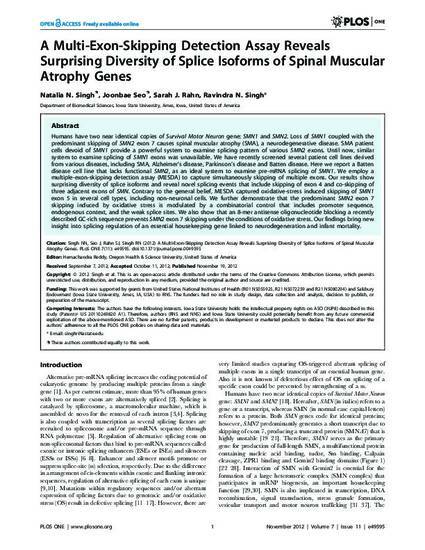 Loss of SMN1 coupled with the predominant skipping of SMN2 exon 7 causes spinal muscular atrophy (SMA), a neurodegenerative disease. SMA patient cells devoid of SMN1 provide a powerful system to examine splicing pattern of various SMN2 exons. Until now, similar system to examine splicing of SMN1 exons was unavailable. We have recently screened several patient cell lines derived from various diseases, including SMA, Alzheimer’s disease, Parkinson’s disease and Batten disease. Here we report a Batten disease cell line that lacks functional SMN2, as an ideal system to examine pre-mRNA splicing of SMN1. We employ a multiple-exon-skipping detection assay (MESDA) to capture simultaneously skipping of multiple exons. Our results show surprising diversity of splice isoforms and reveal novel splicing events that include skipping of exon 4 and co-skipping of three adjacent exons of SMN. Contrary to the general belief, MESDA captured oxidative-stress induced skipping of SMN1 exon 5 in several cell types, including non-neuronal cells. We further demonstrate that the predominant SMN2 exon 7 skipping induced by oxidative stress is modulated by a combinatorial control that includes promoter sequence, endogenous context, and the weak splice sites. We also show that an 8-mer antisense oligonucleotide blocking a recently described GC-rich sequence prevents SMN2 exon 7 skipping under the conditions of oxidative stress. Our findings bring new insight into splicing regulation of an essential housekeeping gene linked to neurodegeneration and infant mortality. This is an article from PLoS ONE 7 (2012): 1, doi:10.1371/journal.pone.0049595. Posted with permission.